A ski season that started in November ends Sunday (April 22) for Heavenly Mountain ski resort. Heavenly Mountain ski resort in Lake Tahoe will be closing for the season April 22. The famed ski resort in South Lake Tahoe will be offering skiing and snowboarding Sunday in its season-finale. Heavenly Mountain is the last of the three Vail Resort properties in Lake Tahoe to shut down for the season. Kirkwood Mountain closed April 8 and Northstar California closed down operations April 15. 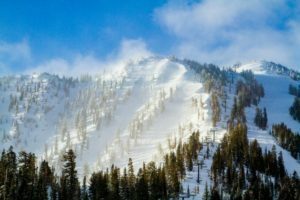 The closing of Heavenly Mountain leaves just two ski resorts open – Mt. Rose and Squaw Valley Alpine Meadows. Located in Nevada, Mt. Rose will be closing in one week on April 29. Squaw Valley Alpine Meadows will remain open until Memorial Day (May 28), weather permitting. Mt. Rose ski resort has some enviable deals as the season winds down for Lake Tahoe ski resorts. Mt. Rose is offering savings on lift tickets for as much as $46 per day, if purchased online and in advance. Tickets bought at the resort remain full price. Skiers and riders can purchase a 2018-19 Ikon Pass in April and get free spring skiing access to Squaw Valley Alpine Meadows, Mammoth Mountain and Winter Park in Colorado. Prices go up $100 on May 1. North America’s newest season pass product offers more than 63,000 skiable acres of unique terrain at 26 premier mountain destinations. For more information please visit www.ikonpass.com. Squaw Valley Alpine Meadows has a “Spring Vertical Challenge” taking place. Running through April 30, the Spring Vertical challenge will reward guests who ski or snowboard 10,000 or more vertical feet in one day with special offers in The Village at Squaw Valley. The following offers are valid between 3-5 p.m. on any day in April for App users who skied 10,000 or more vertical feet that same day. Mt. Rose ski resort in Nevada has a number of tempting deals over the final two weeks of the ski season. 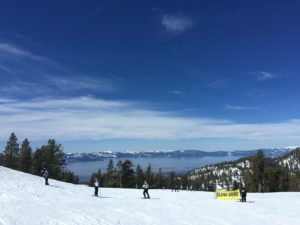 Eight Lake Tahoe ski resorts closed April 15 in what was an up-and-down 2017-18 ski season.